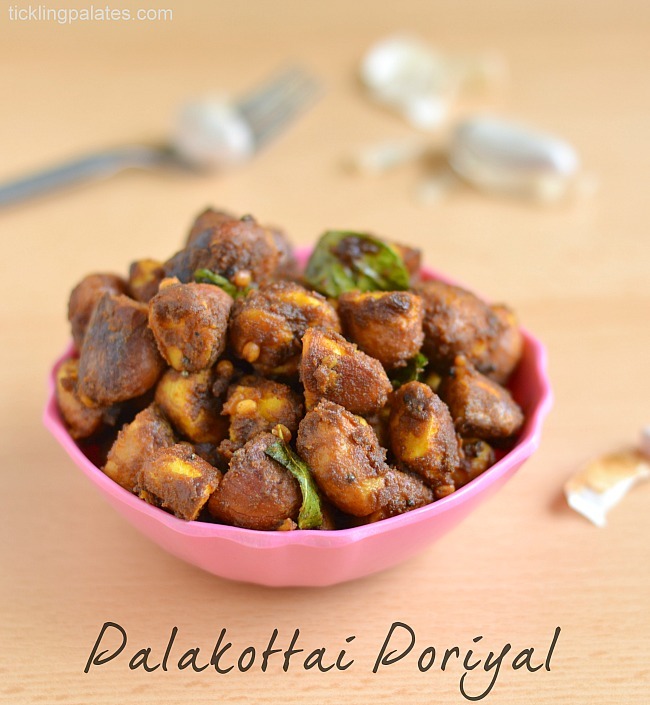 Palakottai Poriyal Recipe – A no onion and no garlic curry recipe that is nutty and spicy that can be served either as a side dish for rice or can simply be enjoyed as a snack. 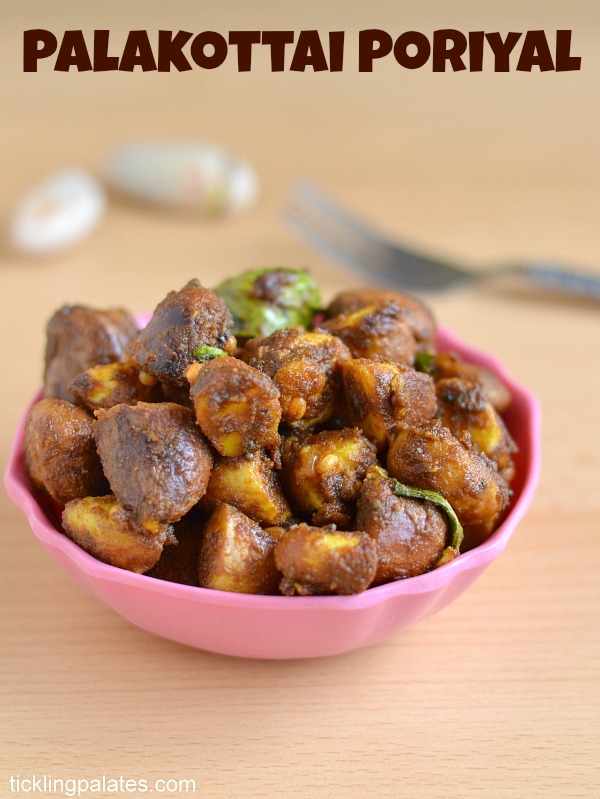 Of all the Palakottai recipes, this Palakottai poriyal is my absolute favorite and I don’t keep a count on how many times I make this curry during the summer time whenever I could get hold of a pack of these. I love to have this palakottai poriyal spicy and hot. This curry not only is enjoyable as a snack but its also lip smacking good when had with rasam and curd rice. The chewy goodness is too good to miss out. 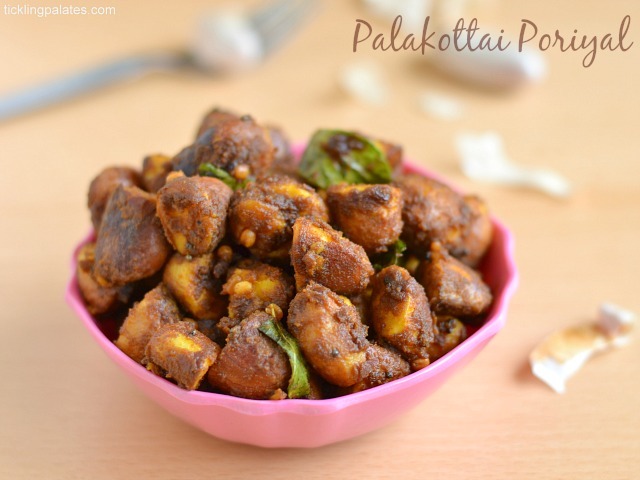 Though I do make this Poricha kootu using palakottai, this recipe is the one that’s often made and enjoyed frequently at home. During the childhood holidays spent in Trichy, this poriyal was the most requested by me and I remember my Grandma making it for me at least twice or thrice every week. It is supposed to increase the body heat and she used to scold me too but that never stopped me. Those days not only was the quality good but the taste was also awesome but I cannot say the same about the ones we get now especially in Chennai. You simply cannot ignore the jack fruit smell when you pass by the person selling it but now even if you hold one to your nose, there is no aroma at all and the fruit feels like rubber and tastes too bland. Make sure that you grease your finger tips with oil before removing the papery white skin to prevent the milk from making your fingers sticky. The quantity taken to pressure cook the palakottai will depend on the quality of the seed. Lesser number of whistles if they happen to be tender and more if they are more matured. 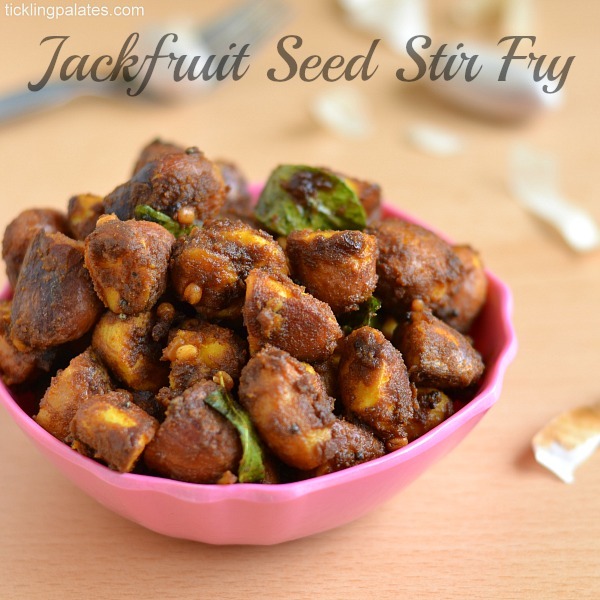 A nutty and spicy stir fry using palakottai also called as jack fruit seeds. Cut each palakottai into 2 horizontally. Remove the thin white film-like skin and keep aside. Place the seeds in a pressure cooker, add 2 pinch salt and water till the seeds are immersed. Pressure cook for 4 to 5 whistles. Tip the contents into a colander to let the water drain completely. Heat a pan with oil. Add mustard seeds and let it crackle. Add urad dal, curry leaves and cook for 2 seconds till the dal changes golden brown in color. Add sambar powder and stir well. 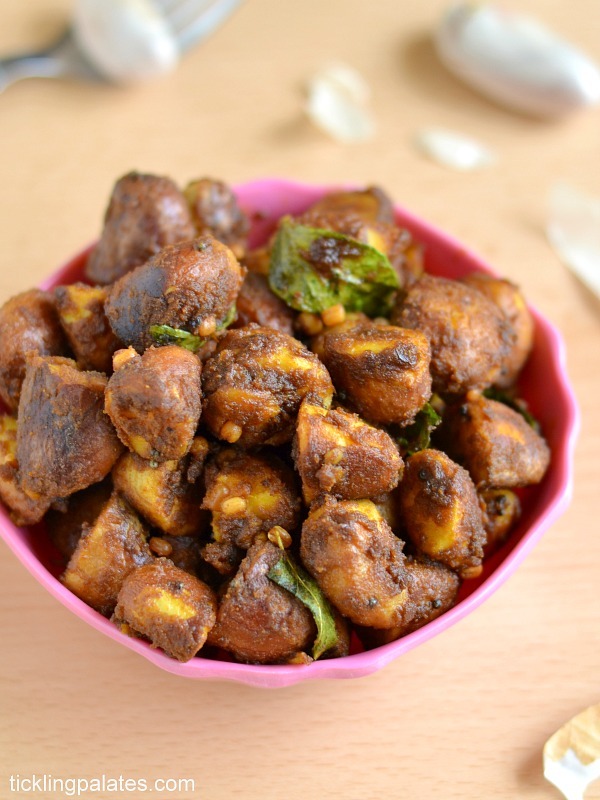 Immediately add cooked palakottai, turmeric powder, 2 tsp water, salt and mix well. Simmer the flame completely. Let the curry cook well for 10 mins till it becomes a roast. Keep tossing in between. Serve hot either as a snack or side dish to rice. lovely recipe, the one change what i do is we never cut the seed instead we hit it using the mortal .